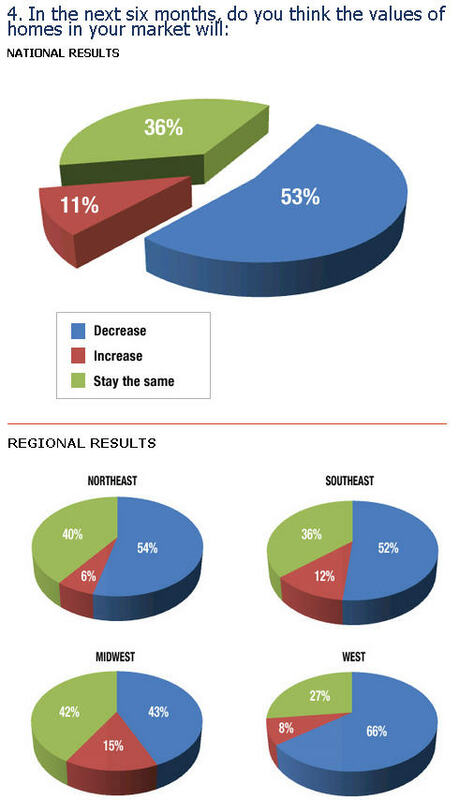 HomeGain's survey shows that 53% of Realtors nationwide think home values in their market will decrease in the next six months (in blue), followed by 36% thinking home values will stay the same (in green) and 11% thinking values will increase (in red). HomeGain®, the first website to provide free instant home values, today announced the results of an extensive nationwide survey on home prices based on responses of nearly 700 Realtors®. The survey shows that 45 percent of homeowners think their homes should be listed 10 to 20 percent higher than what their Realtors recommend. Nearly 20 percent of homeowners think that their homes are worth 20 percent higher than their Realtors' recommended listing price. Homebuyers are experiencing a similar disconnect on price. According to the Realtors surveyed by HomeGain, only 18 percent of their home buying clients think homes are fairly priced. Even with the precipitous decrease in home values over the past year, nearly 60 percent of potential buyers think home prices are too steep. Thirty-two percent of buyers think homes are overpriced by 10 to 20 percent. Twenty-five percent of buyers think home prices are undervalued. Fourteen percent of homebuyers think homes are undervalued by 10 to 20 percent. A recent Zillow® poll showed that sellers were no longer 'in denial' regarding the U.S. housing slide. The latest HomeGain survey, however, underscores that while homeowners may be aware of falling home prices around the country, many believe that the slide doesn't apply to their homes. "Our survey shows that the market and Realtors are telling homeowners their homes are worth considerably less than homeowners think they are," said Louis Cammarosano, General Manager of HomeGain. "Homeowners know that prices have fallen but that somehow doesn't apply to them because they have 'upgraded vinyl' or some such nonsense," stated Realtor and HomeGain AgentEvaluator® member Pamela Frey-Primiani of Keller Williams Realty in Sicklerville, New Jersey. "In other words, their house has the golden doorknob." Fifty-three percent of Realtors surveyed think home prices will fall in the next six months and only 11 percent think home prices will rise. The Obama stimulus package was not viewed favorably by a majority of Realtors. Nearly 60 percent stated that it will have no impact on home prices or actually cause home prices to fall. 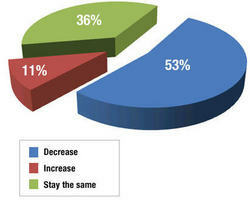 Thirty-eight percent think the stimulus package will stabilize home prices and just three percent believe it will help increase prices. For complete survey results, including regional breakdown and real estate agent commentary, visit HomeGain Releases Results of Realtor Home Values Survey on the HomeGain Real Estate Blog. To receive additional information about the HomeGain real estate survey and to speak with survey respondents about their opinions, attend a live PR conference call on Monday, March 9, 2009 at 11:30 AM PT at homegain.webex.com/event. HomeGain® is a leading provider of online marketing solutions that connect real estate agents and brokers with home buyers and sellers. HomeGain offers free services to find and compare real estate agents, research home values, and view homes for sale. Realtors® use HomeGain's real estate marketing programs, products and tools to connect to consumers, promote their services and grow their business. HomeGain.com receives an average of over five million web visits per month, ranking it in the top 10 real estate websites worldwide since 1999. Classified Ventures™ is a strategic joint venture among five media companies, including Belo Corp., Gannett Co., The McClatchy Co., Tribune Co. and The Washington Post Co., whose objectives are to collectively capitalize on the revenue growth in the online advertising categories of automotive, real estate and rentals.